In addition to the standard visibility splays imposed by the local authority’s Highways Engineers, this site was heavily constrained by a large attenuation tank, which ran diagonally through the heart of the site and a main sewer along its southern boundary together with their associated easements. The need to maximise site use led to a non standard plan form for an industrial shed. This speculative project attracted an end user during the design development stage to provide a headquarters, storage and distribution facility for a local food retailer. 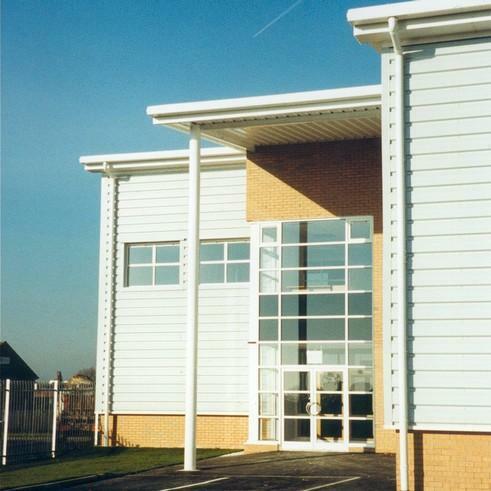 This resulted in a building with a higher than average proportion of office accommodation together with the introduction of trade counter use and refrigeration plant to cope with chillers.